It was 1994 and these cheap computer-generated images were all the rage. I had several of these on the walls of my crappy London apartment. They were amazing then, and they are amazing now. I just came across this one in a box of old things, and it still fascinates me. And yes, you can see the hidden image even in the photo on your screen (click it to enlarge). 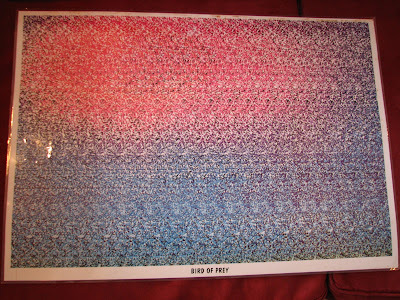 More about stereograms, and how to see them, here. I had exactly same one. I also had the one with dinosaurs. Thank you. I have been searching this image to buy one to remind me my old days.